New York City is famous for its closet-sized apartments. San Francisco residents have become accustomed to living in tight quarters. But New York and San Francisco are extreme examples of expensive housing markets in America. To see just how extreme they are, we analyzed value per square foot data to see how much home $100,000 could buy you in the largest cities in America. Looking to buy a home? Check out mortgage rates in your area. In order to see how much $100,000 would buy you in each city, we compared $100,000 to home values for the largest cities in America. Check out our data and methodology section below to where we got our data and how we put it together. Midwest McMansions – Five of the top 10 cities where $100,000 buys you the most home are in the Midwest. Detroit is ranked first and four Ohio cities make appearances. One potential issue for Midwesterners is that they tend to have relatively low incomes: the median household income in Detroit is only $25,000, for example. Don’t sleep on the South – The remaining five cities in the top 10 are located in the South. They are led by Jackson, Mississippi in second. Big differences across the country – If you had to guess how much more valuable property in San Francisco was compared to Detroit, what would you say? Ten times more valuable? Twenty times? Try 25. 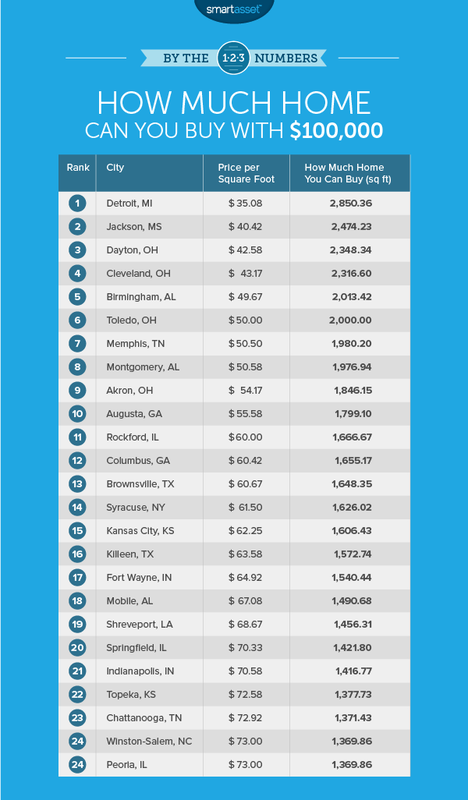 At $35.08 per square foot Detroit has the cheapest homes on the market. In San Francisco, which is the most expensive, costs are $902.42 per square foot. This means that for every square foot of housing you buy in San Francisco you could buy 25 in Motor City. The Motor City has suffered ever since large chunks of the automobile industry drove out of town. They left Detroit with a declining population, a rising unemployment rate and a glut of unfilled housing. Although things are on the up and up more recently, with incomes rising faster than rents, home prices are still low. We estimate that with $100,000 you could buy a 2,850 square foot home in Detroit. The capital of Mississippi comes in second. With homes costing, on average, $40.42 per square foot, we estimate that with $100,000 you could purchase a 2,474 square foot home. For a family looking for an affordable single-family home, Mississippi is a good place to look. Over 95% of homes are of the single-family variety. A Dayton resident who managed to save up $100,000 to splurge on a home, could buy quite a large one. We estimate that in Dayton, where average homes are worth $42.58 per square foot, you could buy a 2,348 square foot home with $100,000. Home plans from Theplanncollection.com show that your average 2,300 square foot home can come equipped four bedrooms and multiple bathrooms. Cleveland is a great place to buy a home for those who like tons of space. With $100,000 to spend, we estimate that you could buy a 2,316 square foot home. Home values also appear to be rebounding, making homes in Cleveland a better investment. From 2014 – 2015, the median home values in Cleveland rose slightly from $65,900 to $66,200. This may signal the end of declining property values in Cleveland. From 2006 – when homes were worth an average of $90,400, according to the U.S. Census Bureau – to 2014, home values in Cleveland had been steadily declining. 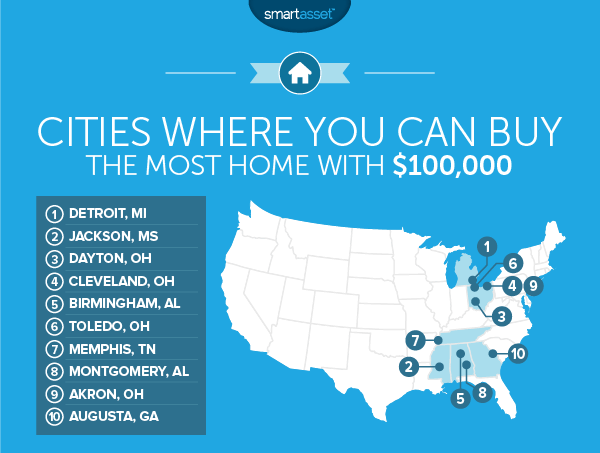 The biggest city in Alabama is the city where you can buy the fifth-most home with $100,000. The average home here costs about $49.67 per square foot, so $100,000 could buy you 2,013 square feet of home. For retirees who are looking to buy a big home and retire, Birmingham is a good place to look because of its low taxes. The state has both a low property tax rate and a low retirement tax rate. According to our data, the average home in Toledo goes for about $50 per square foot. That means $100,000 will get you a 2,000 square foot home. One thing prospective Toledo homebuyers should be aware of is the downward trend in home values. Home values have steadily declined in Toledo, according to U.S. Census Bureau data. In 2007 the median home in Toledo was worth $101,600, and by 2015 that figure had dropped to $78,400, according to the same source. The Birthplace of Rock ‘n’ Roll takes seventh. Here, you could buy a 1,980 square foot home with only $100,000. Unfortunately for the average Memphis household, getting up to the point where they had a spare $100,000 would take quite a bit of saving. The average Memphis household, which earns $36,908 per year, would need to save 10% of income every year for 27 years to get to $100,000. On the plus side, current mortgage rates in Tennessee are pretty low, only 4.04% on average. Montgomery has recently received a ton of acclaim for its revitalized downtown area. This makes the city a great place to buy a home. Overall you can buy 1,976 square feet of home for $100,000 in Montgomery, the eighth-most in the country. It may be a good time to buy a home in Montgomery as mortgage rates are a low 4.1% on average. Akron is the fourth Ohio city in our top 10. Homes here are pretty affordable. On average our data shows that homes go for about $54.17 per square foot. With $100,000 in Akron you could buy a 1,846 square foot home. If you are looking for homes in Akron, Goodyear Heights, named after the tire company, and West Akron are good neighborhoods to check out. We recently found that the relatively affordable housing in Augusta, Georgia makes the city one of the most undervalued in the country. Augusta is also one of the most walkable cities in the South. That means you can take long walks and enjoy those hot summer nights. With a population of 8.5 million in 2015, New York is the most populous city in America. A large percent of those New Yorkers are squeezed into Manhattan, where the high incomes and high population density make for very expensive housing. According to our data, $100,000 wouldnt get you very far in New York. We estimate with that chunk of change you could only afford 232 square feet of home, which is about the size of a very, very small studio apartment. In Los Angeles things are not much better than they are in New York. Zillow data shows that the average home costs about $398 per square foot, meaning with $100,000 you could afford to purchase a small 250 square foot studio apartment. That score puts Los Angeles at 190th out of the 200 cities we analyzed. The Windy City is a slightly friendlier housing market for the average home purchaser with $100,000 to spend. Home prices in Chicago are about half of what they are in Los Angeles, at least on a price per square foot basis, meaning your $100,000 will go about twice as far. We estimate that with $100,000 you could purchase a 606 square foot home. Philadelphia is a great place to buy a home. 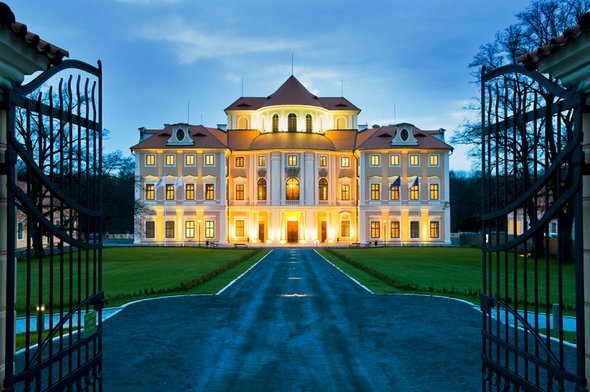 It has some of the same charm as New York City for about a quarter of the price. Homes in Philly sell for about $97 per square foot, while they go for $430 per square foot in New York. 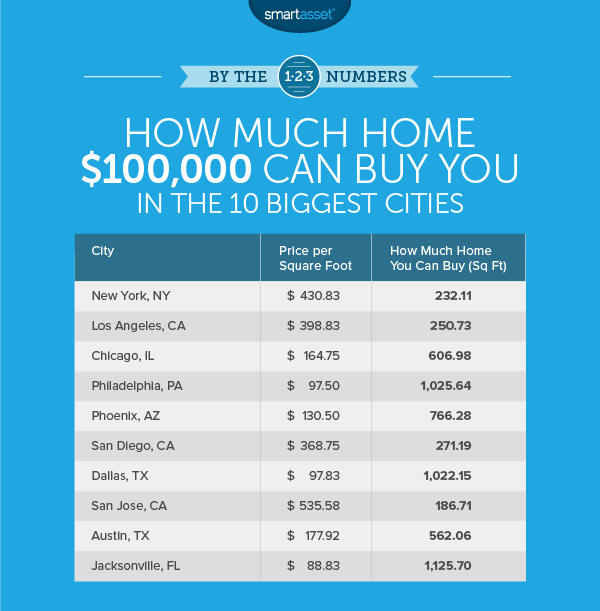 If you come to Philadelphia with $100,000, we estimate that you could buy a 1,025 square foot home. Thanks to its affordable homes, Phoenix is a popular destination for retirees who are looking to settle down. Phoenix is a relatively spread out city so, despite being one of the largest, there is plenty of room for everyone. Homes in Phoenix sell for an average of $130 per square foot which is comparable to other cities like Providence, Rhode Island or Spokane, Washington. With $100,000, we estimate you could purchase a 766 square foot home. San Diego is an expensive place to live and $100,000 won’t get you far when you’re hunting for homes. Fortunately for San Diego residents, they tend to be relatively well compensated. The median household in San Diego makes just under $70,000. Our data shows $100,000 would buy a 184 square foot home. This makes San Diego the 176th ranked city in our study. With a 2015 population of 1.3 million people, Dallas is one of the largest cities in the country. Dallas’ chugging economy makes it a popular destination for people looking to relocate. Homes are not too expensive either, adding to the city’s charm. On average the median home sells for $97 per square foot, making it the 61st-most affordable city in our study. San Jose is even more expensive than New York. Only six cities in our data set were more expensive than San Jose and all but one of them are in the Bay Area. Our data shows that if you had a $100,000 to spend on a home, you would only be able to afford 186 square feet. One good thing going for residents is that California has a relatively low property tax rate. As far as Texas goes, Austin is fairly expensive. We calculate, that with $100,000 you could afford to buy around 562 square feet of home in Austin. This makes homes in Austin almost twice as expensive as Dallas and almost three times as expensive as Brownsville. Cities like Eugene, Oregon and San Bernardino, California have similarly priced homes as Austin. Although affordable for a big city, homebuyers in Austin should beware the property tax rates in the area. Texas has the fourth-highest property taxes in the country, and the average person in Travis county (where Austin is located) pays over $8,500 per year in property taxes. Jacksonville is the largest city in Florida and one of its most affordable. Overall Jacksonville ranks 49th with $100,000 fetching an 1,125 square foot home. Compare this to Miami or Fort Lauderdale, two other large cities in Florida, and you see how much of a deal buying in Jacksonville can be. In both those cities the average square foot of home goes for over $200. To find out how much home you can buy with $100,000, we took $100,000 and divided it by the average home value per square foot in each city. Data on average home value per square foot comes from Zillow and is from 2015.